Toptal is partnering with the Dallas UX Group to facilitate an evening with Stephan Martiniere: a top concept artist and designer in Hollywood with film credits that include Star Wars, Ready Player One, Avatar, Avengers, Suicide Squad, and 300. Stephan is currently working with Magic Leap to design new immersive experiences using advanced AR/VR technology, and he is consulting with leaders in several major cities develop the cities of tomorrow. Join us on September 21st, 7:30 - 9:30pm for this fireside chat, to hear Stephan talk about his process, work, inspiration, and current projects. 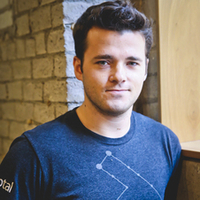 This event will also be an opportunity to meet up with Andrew Graunke, Toptal’s Director of Design who will share information on how Toptal works. Space is limited. For more information and to secure your spot, see the event page.